The psychic gives a pack of cards to a volunteer for shuffling, and after shuffling he takes it back. After spreading the cards in his hands, he asks the volunteer to pick a card, remember what card it is, and then put it back in the pack. He is then asked to shuffle it again and return it. With the card pack m his hands the psychic gazes into the eyes of the volunteer and through his telepathic power knows which card he has selected. Then he need not go through the pack of cards to take out the card. He holds the card pack near the ears, shuffles it and brings out a card. It is the selected card. Effect: Picking the card which you have selected with X-ray powers. Method: Call for a volunteer from the audience, hand over the card pack to him and ask him to shuffle it and return it. Spread the cards on your hands with the broad part towards the volunteer and ask him to pick a card. After noting what that card is he puts it back in the pack. 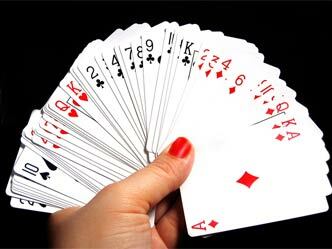 At the same time bring the cards together, bolding the cards with your left hand at the lowest end keeping the card pack facing the volunteer length wise. 99% of the people take the card the same way they have taken out and replace it in the pack. If they are replacing the same way, turn the other broad side towards the volunteer and let him insert it in the pack. Then ask him to shuffle the pack and return it. No one can know where the selected card is. After the pack is returned to you explain to the audience that through your X-ray powers and telepathy you can know the card and pick it out without going through the pack. As you talk, search for the card side that is a little broader than the other cards. Keep the car pack near your ears, explain that you are finding where the card is through your X-ray powers, pass your right hand finger over the card pack, give a hit to the pack at the back, and pull out the protruding card with the thumb and the index finger and show it to the volunteer. It will be the same card which he had selected. A Stripper Deck (also known as a Tapered Deck, Wizard Deck, or Biseauté Deck) allows the magician to control the main location of a card or group of cards easily within the pack. Even after being shuffled into the deck by a spectator, the magician can cut to a selected card. Similarly, even after being lost in different parts of the deck, the magician can move multiple cards to the bottom or top of the deck with a few innocent shuffles. Unlike the Invisible or Svengali Deck, the Stripper Deck can be handled by an audience member unfamiliar with the concept and can withstand a modest amount of scrutiny without exposing the secret; however, this deck is found in a number of beginners' magic kits, so the secret is well-known, even among non-magicians. The cards of a Stripper Deck are slightly tapered, so that the sides no longer form a perfect rectangle. The change is slight enough to be undetected by visual inspection or even casual handling, but if a single card is rotated 180° so that it's tapered in the opposite direction from the rest of the deck, the card's broad end can easily be detected, by feel or even by sight, among the narrow ends of the rest of the deck. At this point the magician can select the target card through sleight of hand. Many of the effects achieved with a Stripper Deck can also be accomplished with sleight of hand.